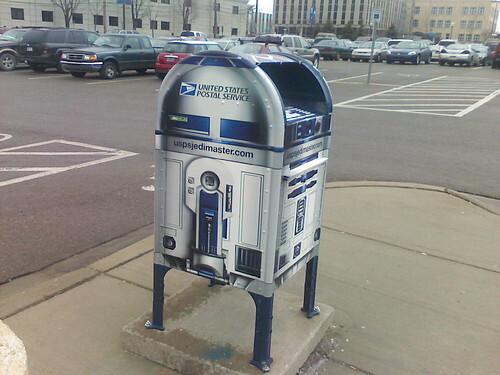 Yeah, it’s an R2D2, official and legal USPS mail drop box. These damn things are popping up all over the city. ← Yeah he means it. I remain baffled by the popularity of the Star Wars thing. And I’m disappointed that the USPS chose Star Wars as the first “official” mailbox re-design. Couldn’t they have used…I don’t know…maybe something from “Kill Bill” or something otherwise cool? What in the what what. That is a profoundly stupid idea. Are my taxes paying for this sort of thing? If so, then I’m completely justified in ripping a mailbox out of its moorings, and selling it on the black market.